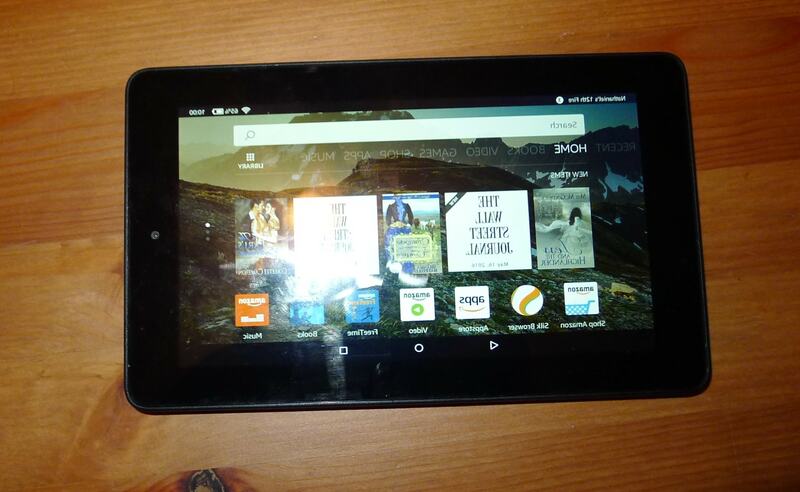 Has Your Kindle Fire Tablet Flipped/Reversed Its Screen? When Amazon launched the new $50 Fire tablet last fall, one way they cut costs was to ship the tablet with only a 90-day warranty, and make a full year's warranty an optional upgrade. Lately I have come to regret being too cheap to spring for the better warranty. For the past couple weeks I have been seeing a new side of my $50 Fire tablet. Lately it's been sporting a goatee and muttering things about the Terran Empire. The bug is not visible in screenshots (they look normal) but the bug does carry over into the settings menu and the apps, which display with the left and right sides reversed. The touchscreen is also affected, and is sometimes swapped left for right and other times it has been rotated 180 degrees. Fortunately for me I'm not the only one to encounter this problem. A quick search through Google reveals that other Android tablets have had similar problems for one reason or another, and that this is a growing problem with the Fire tablet. Several Kindle owners have reported this bug in the Amazon support forums, and all are as baffled as I. "Everything is literally backwards like you put the kindle in a mirror, that's what I'm seeing. It is very difficult to do anything on it because you can hardly ready anything with the screen being flipped," one wrote in February. "Help please." I am having the same issue. Waiting for the kindle to get to 30% so I can try a factory restore. It's not just the words and screen, but the touch functionality is mirrored as well. Not sure if my daughter did this herself or if Amazon pushed an update that is causing this to happen. Will update post when I restore this kindle. This happened to me as well, Just ordered two fire fifth gens, one works perfect the other is like Felicia and Technerds. Text and layout backwards and upside down. straight out of the box. The screen flickers as well, so the underlying problem might be more than a faulty setting. No one has a solution, not even Amazon tech support. The only thing they could suggest is to swap out the defective tablets. That's great for recent buyers, but long-term Fire tablet owners are out of luck. Here's where things get stranger. Not only is this problem immune to restarting the tablet or a factory reset, my tablet has also intermittently fixed itself - twice, in fact. I set out to take a better photo this morning and I discovered the tablet is back to normal, with everything exactly where it's supposed to be. Edit: And now it's broken again. Yes, I have the one thing worse than a bug which broke out-of-warranty hardware; I have a bug which is so broken it occasionally fixes itself. On the one hand that's good news because it means that I can still get some use out of the tablet, but on the other hand it's going to tempt me into trying to fix the bug each time it crops up rather than simply throwing the tablet away. No. In fact I don’t think my $50 fire has ever crashed or required a reboot, it’s stable. I’m not running the latest OS though, since I rooted and disabled updates when I first got it. My guess would be a bad update. Amazon I’m starting to think is going with cheap programmers, and you get what you pay for. It broke again, so I think you’re right. I don’t think a hardware issue would flipflop like this. Yes, there *is* an app for that. Just search for HUD – Heads Up Display. Because when you look for “mirror the screen” you get loads of options for using front-facing camera as a mirror, or displaying the contents of phone screen on TV or monitor. Thanks. I hadn’t thought to check that. If bought with credit card the warranty is usually doubled. I m also screen reverse. Sometimes when i use Teamviewer screen come in normal way. But when tab lock automatically trouble come again. Under Developer options (available after pressing serial number item 7 times), DRAWING, Force RTL Layout direction, turn it off. The only option that should be turned on (at least while installing apks) is ENABLE ADB. This is not the same problem as others may be experiencing, but it may be worth looking into developer options, There are several tools for manipulating the tablet display while developing apps. I’ve recently found a Kindle Fire that’s been in a drawer for about a year. Charged it, and the display is now reversed. But the display also goes to “lines” and turns off. Going to leave it switched off & charge until full, then try again. I have kindle doing exactly the same did you find a solution?